I’m finally getting back to work on my Brompton cardigan after setting it aside a few months ago. For awhile, it felt like I wasn’t getting anywhere. The hazards of a fine knit done on small needles. 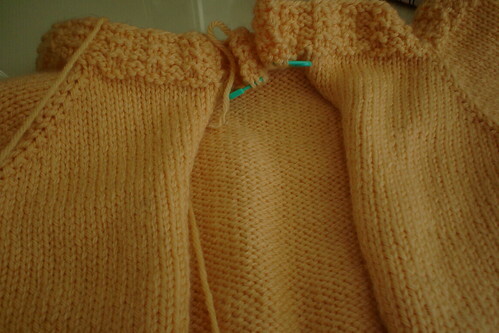 And then I reached the point where the sleeves were put aside, and it started to resemble something sweater-shaped. And since then, it’s been knitting up very quickly. I placed the stitches on scrap yarn this morning and tried it on in front of the mirror, and it’s just lovely. It’s an unusual color, a cross between a pale sunshiny yellow and orange juice. 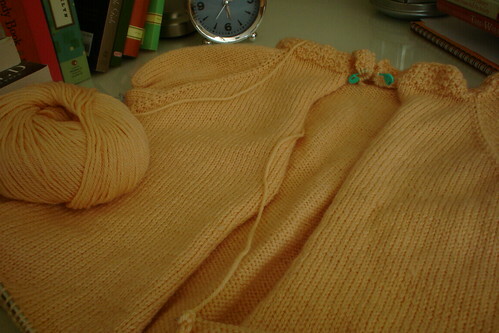 I’m still not sure I’m going to have enough of the Rowan Cashsoft Baby DK to make it hip-length, and my LYS no longer carries that colorway, so I’m working the sleeves before I go any further on the body. I’m not sure I’d buy more anyway, I’ve had so much trouble with this yarn. As I said, it’s a lovely color, and it’s knitting up with a fine bloom, but I paid way too much money for this stuff for it to have so many problems. Each skein has had multiple joins and knots, all of which naturally show up right in the front of the cardigan. But on top of that, it’s very badly spun, and there are little tufts where the cashmerino is thickly spun. I don’t know if I just got a bad batch, but I won’t be buying this yarn again. I have a few other WIP, but those are going to have to wait until I fix this blog. Sometime in the past few days, Blogger changed my template back to the default one and lost my formatting and design elements. I was a little sick of them anyway, so my next project is redesigning this page. Or maybe taking the leap to a different blog. Bah to Blogger! Will mail you. That colour is amazing! Wow!! I’m not as tall as you, perhaps you should just give it to me? Hmmm? When we going to lunch knitty-girl.